The Wednesday high temperature record for Palm Springs — 119 degrees — is in jeopardy, as a relentless heat wave will hit the Inland Empire and Coachella Valley this week, forecasters said. Most of the Inland Empire will see temperatures between 103 and 109 degrees from Monday through Thursday, with the peak of the heat hitting Tuesday and Wednesday, according to National Weather Service meteorologist Brandt Maxwell. The Coachella Valley will see even higher, sole-melting temperatures. The high pressure system said to be the culprit of the coming heat prompted the agency to issue an Excessive Heat Warning that will be in effect from 8 a.m. Monday through 10 p.m. Thursday in the Coachella Valley, San Gorgonio Pass near Banning and Riverside County Mountains and valleys. Even so, this heat wave is not expected to be as sweltering as the one following July 4, Maxwell said. The Monday high is expected to be 102 degrees in Riverside, 103 in Banning, 97 degrees in Temecula, 112 degrees in Palm Springs and 115 degrees in Indio. Thermal is expected to reach 118 on Tuesday and 117 on Wednesday, both of which would break previous heat records, the NWS said. On Wednesday, meteorologists said Palm Springs could reach 119 degrees and Riverside 107 degrees, tying records from 1943. 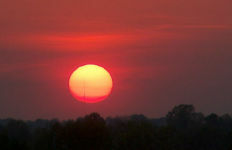 Several record warm low temperatures are also likely Tuesday and Wednesday, forecasters said. Lows in the Coachella Valley may not dip below the 90s throughout the heat wave, meaning the minimal cooling at night could pose a health risk to those who don’t have access to air conditioning because the body needs time to cool down from the day’s heat, according to the NWS. The agency also warned that heat islands could form in dense urban areas where human activity causes the temperature to be higher than in open spaces. Heat islands can cause breathing problems, heat cramps, heat stroke, or even death, the NWS said. County health officials advised locals to take advantage of the 56 cooling centers that opened to the public this month and are available at no cost. A list of cooling centers can be found at www.capriverside.org . High temperatures this month have played a role in the deaths of four people, according to county public health officials. Heat was a factor in the deaths of an 86-year-old woman and 87-year-old man found together July 8 in a Hemet residence, a 91-year-old Bermuda Dunes man found in a residence on July 16, and a 37-year-old man found July 7 in a Hemet parking lot. Though the three elderly victims had underlying health issues that made them more susceptible to the heat, health officials said heat played a role in all four deaths. The NWS said isolated thunderstorms are also possible near the mountains in the afternoons through Monday. Maxwell said the heat will subside back to seasonal levels by Friday, with temperatures mostly in the 90s across the board.